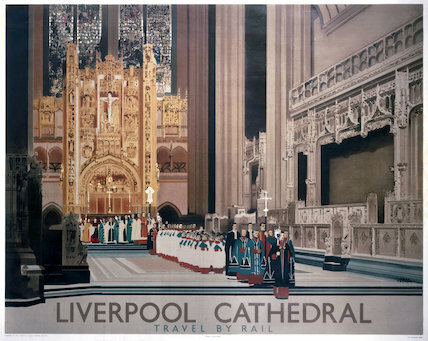 Poster produced for the London & North Eastern Railway (LNER) to promoting rail travel to the city of Liverpool, showing an interior view of Liverpool Cathedral, where the choir is seen in procesion through the chancel. Artwork by Fred Taylor (1875-1963). Printed by the Baynard Pres.